What’s the quickest way to eat 3 cups of torn kale leaves all at once? The answer is simple: make these Super Simple Kale Chips. You will be amazed at how much those fresh leaves shrink! But first…what is kale and why eat it? Kale is a dark leafy green packed with important nutrients like vitamins, fiber, calcium, antioxidants like carotenoids and flavonoids, as well as lutein and zeaxanthin compounds. 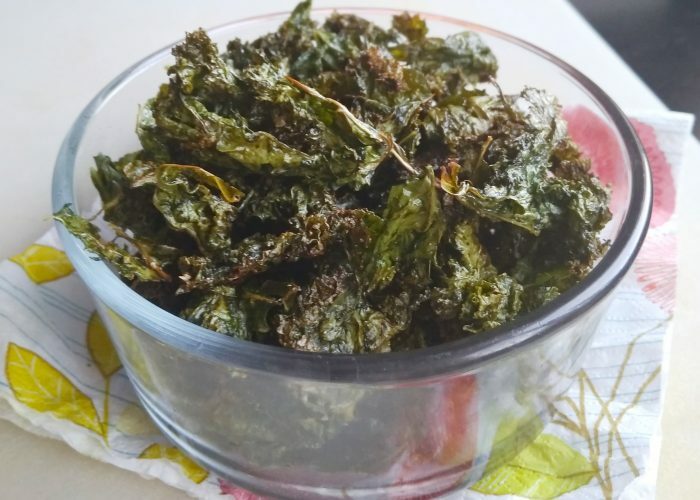 Kale can be served in many different ways (see post The Wonders of Kale), but one way that may become a fast favorite in your household is to turn kale into ‘chips’! Yum! And the taste? My husband says the kale chips taste a bit like Japanese seaweed because they are so crisp and papery thin! A quick way to create delicious and papery thin chips to snack on for yourself or the whole family. Double or triple this recipe depending on the number of people you plan to serve! Preheat oven to 350 degrees F (or 177 degrees C). Cut (or simply hand tear) the leaves off the thick stems/ribs from a bunch of fresh kale into large bite-sized pieces (these pieces will shrink in the oven). Rinse the torn leaves well in a colander, then measure out 6 cups [156 g] into a separate colander or bowl. Use paper towels or a cloth towel to gently squeeze dry the kale pieces to remove any remaining water on the leaves. Next, put these kale pieces into a large bowl and drizzle in the two tablespoons of olive oil. Use your fingers to massage the oil evenly into all the kale pieces (this will help the kale pieces get more crispy during the baking process). Sprinkle on the garlic powder, onion powder and salt, and again lightly massage the leaves to mix these seasonings into the kale pieces. Put parchment/wax paper/foil on 1-2 cookie baking sheets, then spread the kale pieces on evenly to form a single layer. Bake for 10-12 min, then turn the pieces over. Bake another 10-12 min or until the pieces are crisp, but not overly brown. Remove the baking sheets from the oven and let cool slightly. Taste and adjust seasonings as desired. Ready to be enjoyed! Feel free to try a combination of other seasonings! Some suggestions include salt, garlic salt, rosemary, garlic powder, onion powder, nutritional yeast, paprika (or cayenne pepper), Cajun spice and/or ground black pepper. Once cooled, keep the kale chips in an airtight container and these chips will stay crisp for up to 2-3 days. Whether your child normally likes vegetables or not, this is sure to be a winner for him/her and probably the rest of the family! By the way, you can bake and turn the leaves of other vegetables like swiss chard, beets, turnip greens or radish leaves into crunchy ‘chip’ snacks too! I adore kale chips. Even my vegetable free hubby enjoyed them. Now I am craving them. Off to the grocery store.